A former Downsville one-room schoolhouse that’s taken on various purposes since the 1950s has gotten its biggest facelift yet – and a new home. 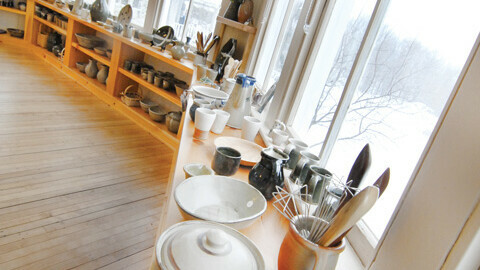 Its newest identity is a beautiful showroom for pottery and local craft works. It will also serve the community as a meeting space. 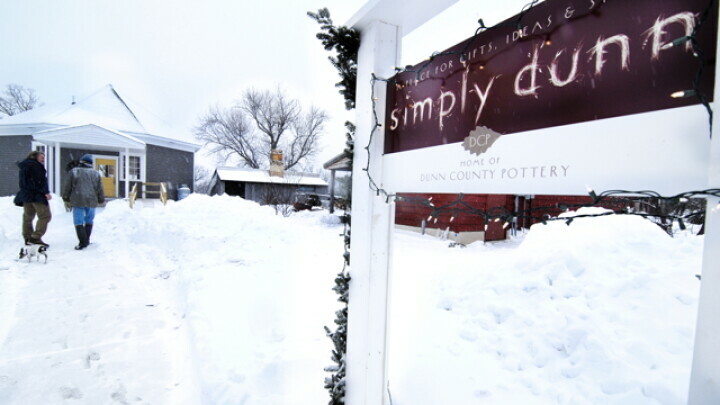 Menomonie resident and potter John Thomas and his wife Kathy Ruggles spearheaded the project, rechristening what was once known as “the chicken coop” Simply Dunn, but not before restructuring the roof and floor, giving it an inside-and-out paint job, moving the entire 800-square foot octagonal schoolhouse a mile-and-a-half down the road to the couples’ home and providing a new foundation. It was not simply done. A few years ago, the duo expanded their products from ceramic objects to toys as well. “It was when the word came out that if you bought toys from certain countries the finishes may contain lead,” John explained. “So I developed a test kit to test for lead in ceramics, and I tested the beak of our grand daughters rubber duck, and sure enough it had lead in it.” From there, John and Kathy took off on the idea of sourcing fair-trade and child-safe toys. “It’s something that would be useful to have in our own lives, but also to offer to other people as well,” John added. Toys, however, aren’t the only fair-trade items available at Simply Dunn. Kathy has worked tirelessly to obtain fair-trade gifts from around the globe, such as baskets, textiles, and beaded items from Guatemala, hand-made silk scarves from Laos, and soaps made in a co-op in Afghanistan. “We hope that Fair Trade helps people in poverty achieve a better wage for the work they do,” Kathy explained. They also sell the work of local artists, from crocheted hats and hand-woven baskets to puzzles made by disabled adults.